16...¦fe8 If Black has chosen 16...b5 17.¥d6 ¦fd8, then we could get the game Landa-Najer, RUS(ch) Tomsk 2006 with a different move order– an impressive White`s achievement! 17...b5 Apparently, in this variation Black tries to move e6-e5 after ¥f4-d6 in order to have an opportunity to take advantage of the f4-square weakening. However in the recent game Vl.Georgiev-Smeets, Wijk aan Zee 2007 Black, not torturing himself with those subtleties, has simply played 17...e5 18.dxe5 ¤xe5 19.f3 ¥h5, and here White decided to exchange on e5. Is there a reason to think it over? 18.¥d6 e5 19.d5 ¤h5 20.¥f1 Possible is 20.¥h3 ¤df6 (20...¤b6 leads to complications after 21.¥c7 ¤f4 22.¥g4!? An approximate variation is 22...¤c4 ( 22...b4 23.¥xb6 bxc3 24.bxc3 cxd5 25.exd5 f5 26.d6) 23.¥d7 ( 23.h5) 23...¤xb2 24.¥xe8 ¤xd1 25.¦xd1 b4!? 26.¤a4! (but not 26.dxc6 bxc3 27.cxb7 ¦xe8-+) is favorable for White. 21.¥f1, and an answer to the question whether White has tempted black knight on an unsuitable square or, on the contrary, lost a tempo, is not clear. After 1...¤f4 22.f3 ¦ad8 23.¥c5 Black concentrates the power of his blows on d5-square, but it is indirectly defended by a weakness of b5-pawn. For the time being I cannot understand what the opponents are going to do next. 20...f6 As an information to be thought over pertaining to the previous comment let us note that computer likes the arrangement with 20...¤df6 even without win of a tempo. 21.b3 Now complications after 21.¥h3 ¤b6 22.¥c7 ¤f4 23.¥g4 ¤c4 do not frighten Black. 23...¥f7 This move looks like an inaccuracy. After 23...¦ec8!, having in mind ¤b6 and ¥f7 when an opportunity presents itself, and also forestalling 24.¦b1, Black seems all right. 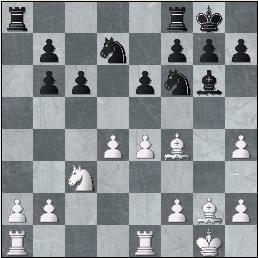 Immediate 23...¤b6 runs into 24.a5!, and bad is 24...¦xa5? 25.¥c7 ¦c5 26.¥xb6 ¦xc3 27.d6 and Black will hardly manage to escape. 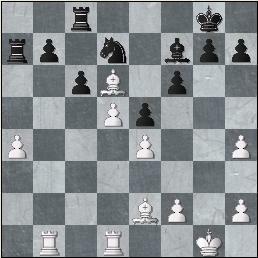 24...¦a7 Aronian "feels" complications superbly, variation 24...cxd5 can hardly be calculated to an end. But after 25.¦xb7 d4 (25...¤f8 26.exd5 ¦ec8 27.¦e3 ¤xd5 28.¦xf7 ¤xe3 ( 28...¦xc3 29.¦xf8+ ¦xf8 30.¦xc3 ¤xc3 31.¥c4+ ¦f7 32.a5+-) 29.¦xf8+ ¦xf8 30.fxe3+/- leads to white advantage) 26.¤b5 ¤f8 27.¤xd4 both in case of 27...exd4 28.¥xf4 ¦xa4 29.¥b5 ¦b4 30.¥d6 ¦b2 31.¦a1, and of 27...¦xa4 28.¤f5 ¦ea8 29.¦eb1 there ensue positions, in which Black might have problems with defense of his pieces. 25.¦ed1 ¦c8 26.¤e2! ¤xe2+ Black has to exchange his active knight, as bad is 26...¥h5? 27.¤xf4 ¥xd1 ( 27...exf4 28.¥h3) 28.¦xd1 exf4 29.¥h3 b6 30.¥e6+ ¢h8 31.dxc6 ¦xc6 32.¥b8 ¦xe6 33.¥xa7+- and White should win. 27...cxd5?! 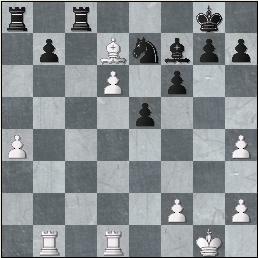 White has managed to exert an evident pressure, and defense demands accuracy from Black. I have a feeling that the move made during the game needlessly opens new lines and diagonals and aggravates Black`s difficulties. To my mind better is 27...¤f8 or 27...h5!? covering the g4-square and removing the weakness of the back rank. 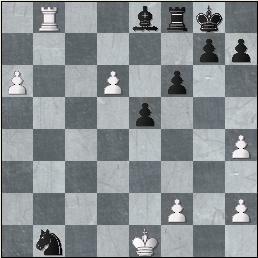 Black position stays defendable. 29.¥b5 ¦aa8 after 29...¥e8 30.¦dc1 ¦xc1+ 31.¦xc1 ¦a8 32.¥xe8 ¦xe8 33.¦c7 (or even 33.h5!?) Black with his sluggish knight is doomed. 32...¤c6 By intuition it is understood that the pawns should, in every likelihood (and exactly "in every likelihood"), queen, but to write down variations for this position is an extremely thankless task. Let`s try and examine 32...¤d5: 33.¥xc8 ¦xc8 34.¦xb7 ¥e6 ( 34...¦d8 35.¦db1) 35.d7 (35.a5 ¤f4 seems imprecise (bad is 35...¤c3 36.a6 ¤xd1 37.a7+-) 36.¦db1 (also unclear is 36.a6 ¤h3+ ( 36...¥d5 37.d7!) 37.¢g2 ¤f4+) 36...¢f8 37.¦b8 ¢e8 38.a6 ¢d7 39.a7 ¥d5, and Black manages to defend himself somehow) 35...¦d8 36.a5 ¤f4 37.a6 ¤h3+ 38.¢g2 ¤f4+ 39.¢f3 ¥h3 40.¢g3 ¥f5 41.f3+-, main line seems more or less logical. 33.¦xb7 ¤d4 34.¥xc8 ¦xc8 35.¦db1 ¦f8 On 35...¤f3+ the most accurate answer is 36.¢h1 ¦f8 37.d7 ¥e6 38.¦c1+-, and White wins a piece, keeping the a-pawn alive; on 35...¥b3 it is not worthwhile to be tempted with taking back two pieces for a rook, clearly more rational is 36.a5; I sincerely hope that there are analysts with hardy health, who will sort out 35...¥e6! ?, that seems most stubborn. In a rough variation 36.a5 ( 36.¦b8 ¤f5 (but not 36...¦xb8 37.¦xb8+ ¢f7 38.a5) 37.a5 ¤xd6 38.a6 ¢f7, and Black is O¢.) 36...¤f3+ 37.¢h1 ¤d2 Black still holds his grounds. 38.¢f1! Somewhat less accurate is 38.¢g2 ¥c6 39.a6 ¤d2+ 40.f3 ¤xb1 41.a7 ¢f7 42.d7 ¢e7 43.¦xf8 ¢xd7 44.a8£ ¥xa8 45.¦xa8 ¢e7 46.¦a7+ ¢f8. 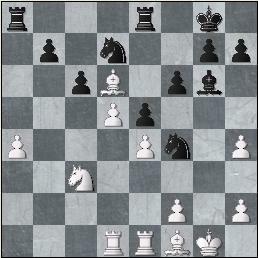 Now to catch the knight immediately does not seem possible, but after 47.h5! 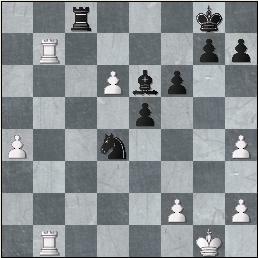 with a threat of h5-h6 there is no rescue for Black.